Making its way to the land that made Sri Lankan Crabs famous, Ministry of Crab took to Singapore for an exciting three-day pop-up at the Shangri-La Hotel, Singapore from 11th to 13th July 2018. 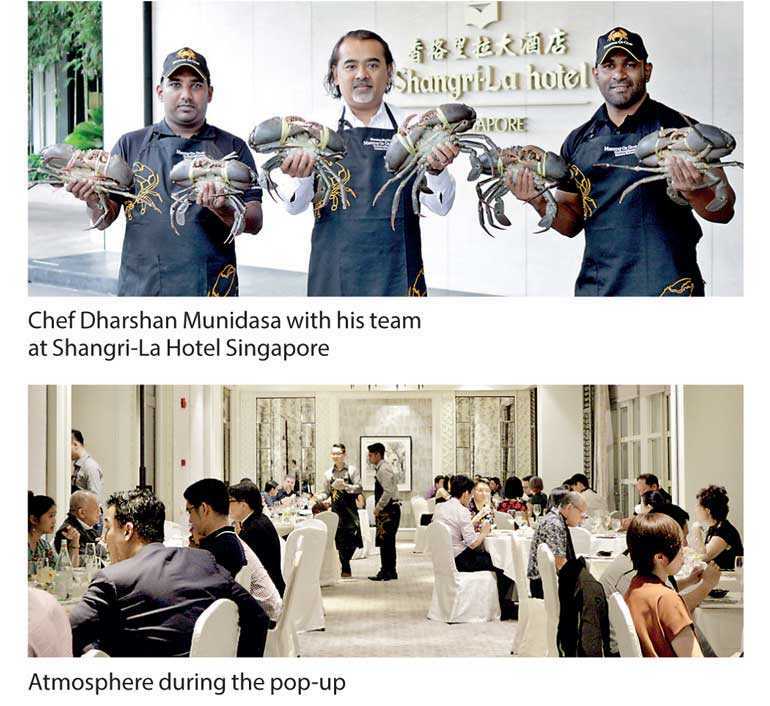 Taking the Ministry of Crab experience beyond borders, renowned Chef Dharshan Munidasa accompanied by his team put together a five-course dinner, which featured several signature dishes of the restaurant catering up to 300 diners. Ministry of Crab, an Asia’s 50 Best Restaurant, continued its streak of international pop ups by showcasing some of its authentic dishes in a specially curated menu, which included the creamy and decadent Crab Liver Pâté, Baked Crab, the flavoursome Garlic Chilli Prawn and the fiery Pepper Crab. Starring the lagoon crabs and freshwater prawns, diners were able to sit through an exclusive dining extravaganza showcasing the fine flavours of the crustaceans coupled with bold Sri Lankan spices. Being the first hotel of the Shangri-La Group, the Shangri-La Hotel, Singapore established over four decades ago has a long standing history of delivering international standards of quality and service. Befitting the Ministry of Crab dining experience indulged at the historic Dutch Hospital in Colombo, the pop-up took place at the hotel’s Dutch Pavilion, which was formerly a Dutch School. The award winning property comprises of three wings with 750 guestrooms. Embodying a garden of life, the luxurious hotel houses a number of recreational facilities, lush gardens, banquet facilities and seven restaurants & bars.